(Reuters) - U.S. stock index opened higher on Monday as reports of planned trade talks between the United States and China raised hopes of a potential resolution to their trade spat. Ten of the 11 major S&P sectors were higher, with the materials (.SPLRCM) and industrial (.SPLRCI) sectors leading the pack. The utilities index (.SPLRCU) was the only laggard. Shares of Boeing (BA.N) rose 0.9 percent and Caterpillar (CAT.N) 0.4 percent. At 9:52 a.m. EDT the Dow Jones Industrial Average (.DJI) was up 90.30 points, or 0.35 percent, at 25,759.62, the S&P 500 (.SPX) was up 4.63 points, or 0.16 percent, at 2,854.76 and the Nasdaq Composite (.IXIC) was down 5.78 points, or 0.07 percent, at 7,810.56. Nike (NKE.N) rose 1.8 percent and was the top gainer on the Dow, after two brokerages raised their ratings on the stock. Intel's shares (INTC.O) dropped 1.2 percent, the most on the Dow, as Cowen & Co said the U.S. chipmaker's new security bugs were potentially a big deal for public clouds. Tesla (TSLA.O) dropped 3 percent after Reuters reported that PIF, the Saudi Arabian sovereign wealth fund that Chief Executive Elon Musk has said could help fund a go-private deal, is in talks to invest in aspiring rival Lucid Motors Inc.
SodaStream's U.S.-listed shares (SODA.O) leaped 9.6 percent after PepsiCo (PEP.O) said it would buy the Israel-based household drink-machine maker for $3.2 billion. PepsiCo's shares rose 0.6. News Corp (NWSA.O) shares fell 4.2 percent, the most among the S&P 500 components, after Morgan Stanley downgraded shares of the Wall Street Journal owner. Advancing issues outnumbered decliners by a 2.82-to-1 ratio on the NYSE. Advancing issues outnumbered decliners by a 1.65-to-1 ratio on the Nasdaq. The S&P index recorded 35 new 52-week highs and no new lows, while the Nasdaq recorded 70 new highs and 20 new lows. 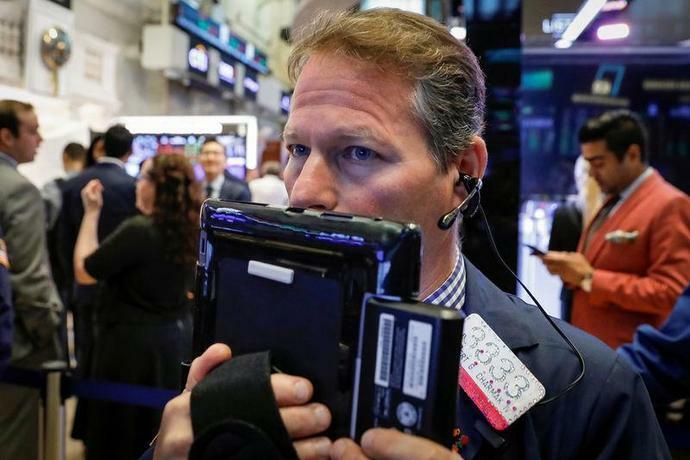 Wall Street's main indexes hovered below record levels as investors wait to see if results from major companies ease concerns about an earnings recession. Among the biggest boosts to the S&P 500 was Twitter Inc which surged 13.6%, touching a near nine-month high, after posting better-than-expected quarterly revenue and a surprise rise in monthly active users. Coca-Cola Co rose 2.6% after its quarterly sales beat estimates. With their combined $4 billion in operating losses last year, some argue that the days of aggressive ride pricing are numbered. Don&apos;t bet on it.